In what is considered as the first-ever opportunity to catch a glimpse of Pawan Kalyan and Venkatesh together on silver screen, Gopala Gopala is all set for grand release on Saturday, Jan 10. Touted to be Telugu remake of Hindi blockbuster Oh My God, naturally, comparisons are bound to be drawn and expectations on the remake are too high. As per the inside sources, both Pawan and Venky share good camaraderie in the screen and that is said to be the USP of the satirical drama. Like in the original Hindi version, Pawan Kalyan enters the scene before the interval itself and is there in the entire second half for over 50 minutes. It is said that the Pawan's role offers 100% treat. 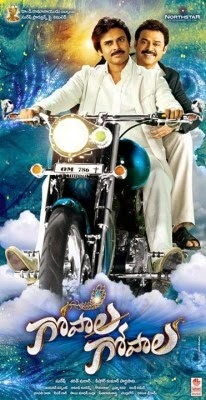 Several new scenes have been included in the Telugu version, which also includes 2 amazing songs pictured on the Power Star. The Krishnamashtami song - 'Baaje Baaje' is already a huge hit and is topping all the charts on radio and the music channels. Also scenes involving wife Shriya Saran and husband Venkatesh are added in Telugu to extend Shriya's role unlike original. Kishore Kumar Pardasani's directorial, Gopala Gopala is produced by Suresh Babu and Sharath Marrar under Suresh Productions and Northstar Entertainments banners. The film is releasing on the eve of Sankranthi.